This interaction will spark a runaway feedback loop that will smack asset valuations back to pre-bubble, pre-pyramid scheme levels. According to the conventional economic forecast, interest rates will stay near-zero essentially forever due to slow growth. And since growth is slow, inflation will also remain neutral. Apparently unbeknownst to conventional economists, trends eventually reverse or give way to new trends. As a general rule, whatever fundamentals are pushing the trend decay or slide into diminishing returns, and new dynamics arise that power a new trend. I’ve often referred to the S-Curve as one model of how trends emerge, strengthen, top out, weaken and then fade. Trends often change suddenly, as in the phase-shift model, in which the status quo appears stable until hidden instabilities cause the entire “permanent and forever” status quo to collapse in a heap. The demographic case is actually a study of labor, capital and savings. In essence, the authors of the paper are saying that the vast expansion of the global workforce (led by the emergence of China as the world’s workshop) is a one-off that is about to reverse as the global Baby Boom generation retires en masse. 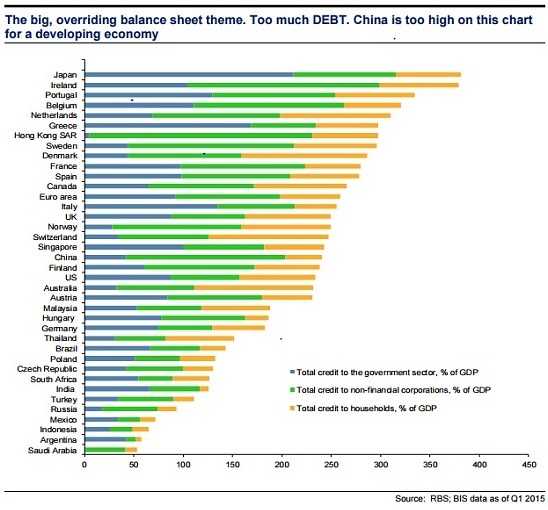 They also argue that the equally vast expansion of credit/debt that’s powered the global expansion in the 21st century is also a one-off, as this monumental debt overhang has a characteristic peculiar to debt: it accrues interest, and as the debt balloons, even low rates of interest add up, weighing on weak growth and soaring entitlement spending. Although it’s not popular in today’s debt-dependent zeitgeist to mention this, debt is not capital. Put another way: savings still matter, and as the older generation of workers retires, they will draw down their savings, a process that will make real capital (as opposed to lines of credit resting on fictitious/phantom collateral) more scarce and thus more costly for those wishing to borrow it. Since it’s a given that human labor is being replaced by robots and automation, the authors’ call for higher wages strikes many as a false hope. If the human labor force is shrinking due to automation, why would wages for the remaining workers rise? One little understood factor helps explain how labor can be scarce even as many jobs are automated: the easily automated work is commoditized, and low-touch, meaning that the human “touch” isn’t the value proposition in the service. But the value of high-touch services is added by the human presence. Do you really want to go to a swank bistro and place your order/retrieve your food from an automated service kiosk serving automated-prepared meals? Isn’t the value proposition of the bistro that you will have a knowledgeable and experienced service and kitchen staff? Granted, there may be people who will be delighted to be served in cubicles by robots, but since we’re social creatures, this will wear thin for those who can afford more than an automated fast-food meal. Even the most modest discounting of the hype about AI provides a more granulated understanding that not all work can be commoditized and indeed, nontradable work that cannot be commoditized will increase in value precisely because its value isn’t created by the process of commoditization. If the labor force shrinks at a rate that’s faster than the the expansion of automation, wages will rise even as automation replaces human labor. I explain this further in my book on work in the emerging economy, Get a Job, Build a Real Career and Defy a Bewildering Economy. Gordon and I add the systemic fragility introduced by financialization to the demographic argument. The entire global asset market–stocks, bonds, real estate and commodities–is at heart a pyramid scheme in which the rapid expansion of credit drives asset prices higher, and since assets are collateral for additional debt, the higher asset valuations enable a new round of hyper-credit expansion. This pushes asset valuations even higher, which sets the stage for an additional expansion of credit, based of course on the astounding rise in the value of the collateral supporting the new debt. Central banks have powered this pyramid scheme by buying bonds and stocks with currency created out of thin air. 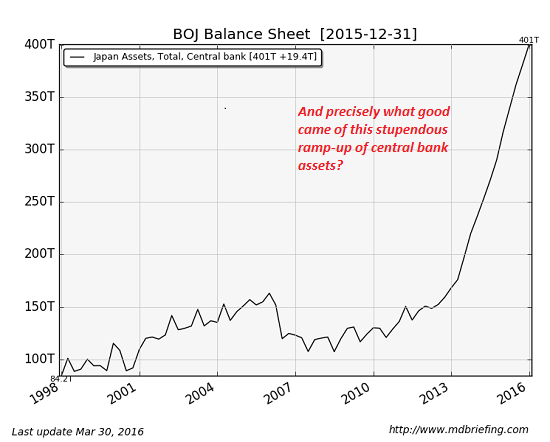 This chart of the Bank of Japan’s astonishing balance sheet is a bit outdated; the BoJ has purchased so many bonds and ETFs (stock funds) that it is now a major owner of Japanese stocks and bonds. My view is that once this tsunami of new debt-based currency hits the real-world economy, inflation will move a lot higher a lot faster than most pundits believe is possible. Trillions of yen, yuan, euros and dollars have flooded into the asset pyramid scheme. Once this tide washes into real-world goods and services, the inevitable result is inflation. The tectonic forces of demographics meeting the increasingly fragile pyramid scheme of financialized debt-inflated asset bubbles will more than reverse the 30+-year trends of ever lower inflation and interest rates: this interaction will spark a runaway feedback loop that will smack asset valuations back to pre-bubble, pre-pyramid scheme levels.